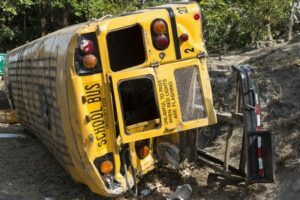 Steps to Take after a School Bus Crash - BJE Law, P.A. The unfortunate truth is that news stories come to light every day about bus drivers acting negligently and harming students as a result. If you have children still young enough to ride the school bus everyday, this is what you should know. What Are the Bus Driver’s Legal Responsibilities? Under the law, bus drivers must follow all traffic laws, pay attention to each child’s well-being, and follow all procedures to ensure safe boarding and entry from the bus. Drivers are obviously not permitted to smoke, drink, text, or commit other offenses. What Types of Bus Accidents Usually Occur? Child-crossing accidents account for the most child injuries and deaths. This type of accident occurs when a child is struck while crossing the road to board the bus before school or get home after school. The bus driver may not see the child still walking across the street, or may be distracted and simply start to drive too early. Single-vehicle bus crashes also occur when the bus driver is distracted or struggles to handle conditions like icy roadways or heavy rain. Of course, a multi-vehicle accident is also possible in which the bus collides with another vehicle or object. What Courses of Action Do Parents Have? If a child is injured in a bus accident as a result of the bus driver’s negligence or another driver’s negligence, parents can sue the person or people responsible on behalf of their child. Personal injury attorneys can investigate the situation and aggressively represent in order to gain compensation for emotional trauma, medical bills, lost wages, and more.